The osprey (Pandion haliaetus), sometimes known as the fish eagle, sea hawk, or fish hawk, is a diurnal, fish-eating bird of prey. 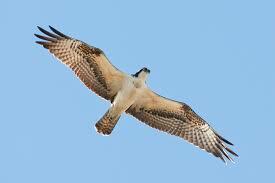 It is a large raptor, reaching more than 2 feet in length and 6 feet across the wings. Size relative to a 6-ft man. Reader prime number # 37 wants to know why Harriett is discussing the moments before the Big Bang. “Let me ask you this,” said Harriett, hoping not to sound condescending. “Say you have a mission, a calling, to teach children. Would you walk into a classroom of 5 and 6 year-olds without having prepared yourself for your mission? Didn’t you have to learn the alphabet and how to read and write? Didn’t you have to go to school; didn’t you have to go to college; didn’t you have to learn how to interact with children? In short, didn’t you have to do everything in your power to prepare yourself for your mission? Only a fool would set off to accomplish a mission, especially a very complicated, important mission, such as Saving the World or at least Life on Planet Earth as we know it, without studious preparation. More on this subject later.